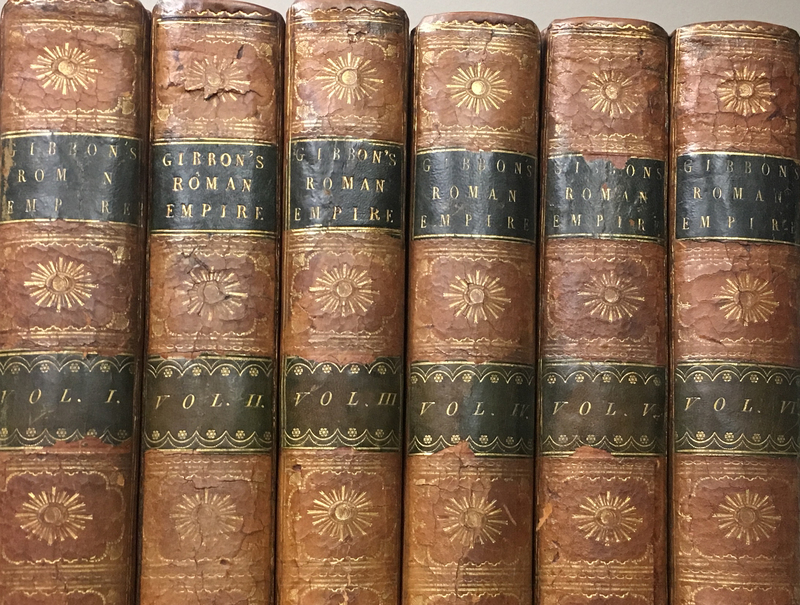 Library intern Kris Stinson presents an eighteenth-century set of Edward Gibbon’s The Decline and Fall of the Roman Empire and discusses the influence of classical ideas and literature on Revolutionary War participants. First published in 1776, Gibbon’s revolutionary work wove a provocative narrative on the causes of the decay and collapse of the late Roman empire, a society with which early Americans felt a peculiar affinity. Delving into Rome’s complex imperial structure and the characters upon whose fate it rested, Gibbon presented readers in the late eighteenth century with a compelling argument that culminated in his now infamous critique on religion’s relationship to empire. Gibbon’s history was immensely important to the English-speaking world and his approach to the cycle of civilizations had a considerable effect on Enlightenment views about the natural history of nations and empires that played into the ideas and ideals of America’s own revolutionaries. The presentation will last approximately 30 minutes with time afterwards for up-close viewing of the books.